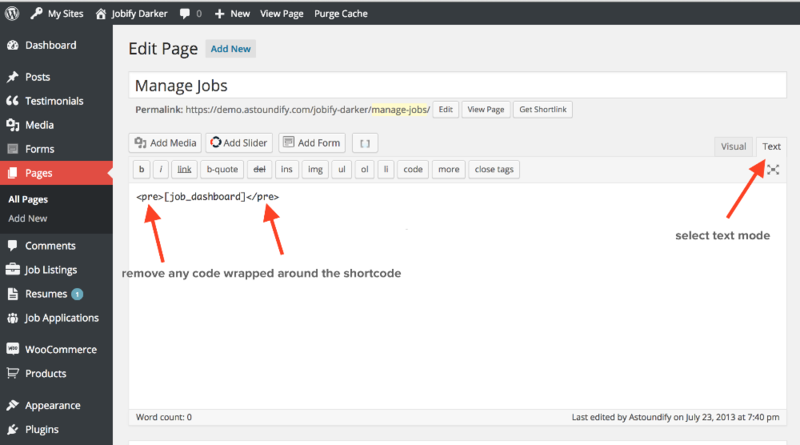 Are you seeing a WP Job Manager shortcode display incorrectly once you add it to a page? For example you add a shortcode [submit_jobs_form] or [submit_resume_form] to a page but it displays incorrectly, the reason is WordPress has wrapped some code around the shortcode, once you remove the extra code and update the page the shortcode will be styled correctly. Edit the page and select the "Text" option in the editor window. Remove the <pre> </pre> code wrapped around the shortcode.